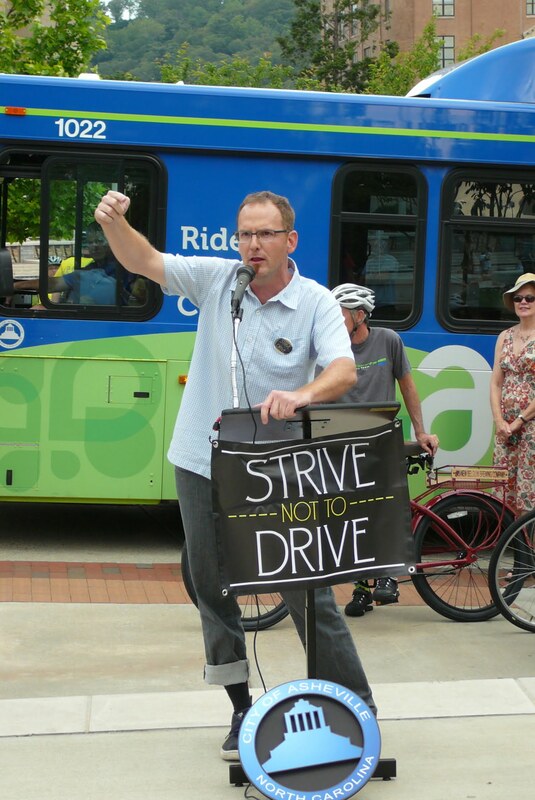 On behalf of Asheville on Bikes, I’m excited to announce that the proposed legislation designed to curtail the expansion of bike lanes and sidewalks has been struck from HB44 and will not become law! This summer AoB encouraged the community to contact their representatives and oppose section 7 of HB44. And the community overwhelmingly responded to the call to action. We acted, and our representatives responded to our collective voice. Thank you all for your participation. Together we roll forward and expand access to safe and complete streets. I would like to publicly thank Representative Chuck McGrady, The Asheville Area Chamber of Commerce, New Belgium Brewing Company, People for Bikes, Bike / Walk NC and the Blue Ridge Bicycle Club. Each of them worked diligently to keep this provision from passing. Our success depends on partnerships, and I appreciate their active involvement in this campaign. We’ve all worked hard over the last few month to ensure our streets continue to work for all people, moving by many modes. Today’s success calls for a celebration. Please join AoB at Catawba Brewing Company’s Rick Room on the South Slope on Thursday, Sept. 24 for Beers for Gears. At 8 pm, we’ll have a toast to celebrate our recent success. Together we roll forward.